Cash transactions are transactions that directly affect one of your bank accounts1. We use the term “Cash” somewhat loosely here to represent not only those transactions that involve the “folding stuff”, but also cheques, credit cards, automatic payments and so forth—in fact any financial transaction that is not an invoice. There are two types of cash transactions: receipts and payments, and each type has its own tab view in the Transactions window. In addition, you can transfer funds between bank accounts with the Transfer Funds command. A Payment represents money that has left one of your bank accounts. If the payment is for an invoice that has already been entered into MoneyWorks it will need to be processed specially— see Paying Your Creditors. A transaction entry window will open. Use the Type menu to set the transaction type. Note: MoneyWorks will (after confirmation) clear any information in a transaction when the type is altered. The supplier’s name will appear in the To field. If you have the address fields showing, the address will also be displayed. If payment is being made for an invoice see Paying Your Creditors2. MoneyWorks will have inserted a reference number one greater than the previously entered one. If this is correct, you need not type anything in. Historically this was the cheque number, but if you are not using cheques any more then it is just a reference number. If you have entered a supplier code into the Supplier field, the To field will already contain the supplier’s name. You can enter up to 1000 characters into this field. The OK and Next buttons dim when an amount is entered into the Amount field. 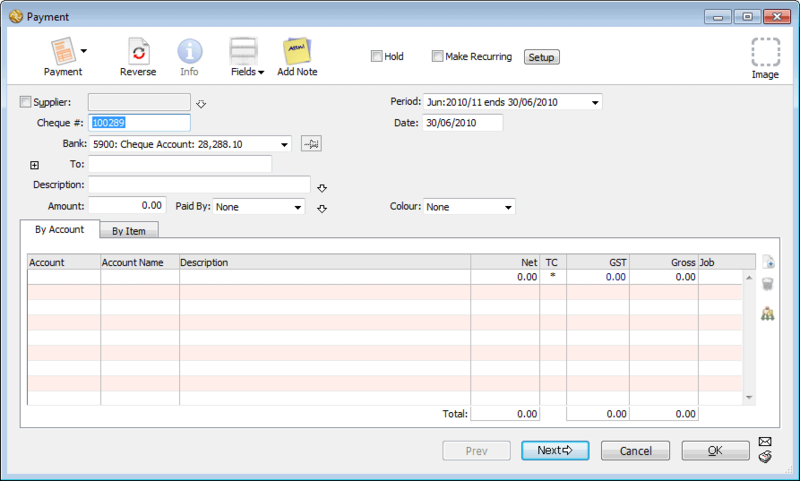 The transaction is not complete until you have allocated the total amount to one or more accounts. This indicates the method of the transaction (cheque, cash etc. )—for payments this is purely for your own information. Use the Views menu to alter the number of fields. Additional fields may be shown on the entry screen. These are controlled by the Views toolbar button. See Fields further details of these fields. If the Supplier field has a creditor code in it, this will have defaulted to Payment on Invoice (not MoneyWorks Cashbook). The Amount for the payment needs to be allocated to one or more accounts before the transaction can be entered. Click OK if this is the last payment to be entered. Clicking Cancel discards the transaction.